The hotel is 10 km from the La Gomera Airport if you travel by plane. Hotel is located on a cliff and also under the cliff by beach.The surroundings of the hotel is well kept and is looking very good. They have even lift which will take you from the cliff to the beach. It is a part of the hotel. Rooms are not very big but it is sufficient. There are two big pools. One on a cliff and other one by the beach. The one on the cliff is during the day almost full so if you enjoy silent surroundings try the pool by the beach. The food was good but the dinner is mostly from fish during the week. As this is not so big hotel the choices of different food are limited. From the main restaurant is a nice view on the sea. Try to arrive early so you can sit outside and enjoy the view. You can get to the hotel by a car as mostly guest had done. The parking places are quickly full so you have to park outside on the street. Near the hotel(you have to go there by a car) are also nature beach but it is very rocky so I don't recommend it. 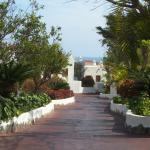 We were very satisfied with the hotel and would return again if we will go back to La Gomera island. The hotel and island are very nice...The hotel is 10 km from the La Gomera Airport if you travel by plane. Hotel is located on a cliff and also under the cliff by beach.The surroundings of the hotel is well kept and is looking very good. They have even lift which will take you from the cliff to the beach. It is a part of the hotel. Rooms are not very big but it is sufficient. There are two big pools. One on a cliff and other one by the beach. The one on the cliff is during the day almost full so if you enjoy silent surroundings try the pool by the beach. The food was good but the dinner is mostly from fish during the week. As this is not so big hotel the choices of different food are limited. From the main restaurant is a nice view on the sea. Try to arrive early so you can sit outside and enjoy the view. We very much appreciate your comments regarding your stay at Jardin Tecina Hotel. It is always a pleasure to receive positive feedback. We are pleased to hear that you were satisfied with our hotel and location. We must agree, the view of the restaurant is realy nice! Thank you again for sharing your experience, and we hope to welcoming you in the near future. On arrival for my three night stay I was informed that the Internacional & Club Laurel restaurants have to be pre-booked, I certainly was not expecting that, and surely this should have been pointed out upon booking. When I tried to book fairly early the following morning, I was informed that both restaurants were fully booked both for that night and the following night so I never got to eat at the hotel restaurants (I do not eat buffet/canteen or tapas). Luckily I was able to get a table all three nights at the excellent restaurant Junonia in Playa de Santiago, though it is quite a walk from the hotel even using the lift. My intention had been to dine the three nights at the three restaurants Junonia, Club Laurel & Internacional. The signage at the hotel is chronic - finding reception or the breakfast room is ridiculously difficult. I stayed in a 'superior' room near the cliff edge, quite a well sized pleasant room but the balconies offer no privacy, you can see and be seen by all your nearish neighbours and passers-by on the footpaths, so I never sat out on the balcony. The shower is over the bath with a plastic shower curtain, plastic shower curtains are a pet hate of mine, they could be fairly easily and cheaply be replaced with a swivelling glass screen. The whole site is built on a fairly steep slope which results in having to walk on steep ramps or steps to get anywhere, I found this uncomfortable and many others were obviously having great difficulty, be aware. One day I left my camera in my car and did not find out till I arrived at my room, the camera stayed in my car till the next day - no way was I going to make that massive hike back to my car in the top car park. I may return to Playa de Santiago, but I would not stay at Jardin Tecina again. Thank you for share with us your review regarding your recent stay at our hotel. Regarding the restaurant booking, as explained on our website, our A La Carte restaurant must be booked, that for, you can always contact our staff per email or using our Hotel App. We really sorry that all our restaurants were full during your stay. Our Tasca Fandango was available with a very special menu with the best of the Spanish cuisine. The satisfaction of our clients is our main goal. We will take into account your remarks, to detect the points that we can improve. Although this is a large hotel complex with lots of rooms, the hotel never seems busy as there are many places to relax, eat , swim , play Tennis etc etc.There are 3 swimming pools so they never get busy, the hotel provides free beach towels, the top pool also has 2 hot tubs sunk in the ground. There is a main pool for children and adults close to the main building and a fantastic pool in the beach Laurel complex down by the sea, this is a salt water pool which keeps warm. to gain access to Laurel beach you have to go in a lift which travels through the cliff side, amazing experience and you walk through a cave to gain access to the sea front. You can also walk to the village center in approx 15 minutes which has a beach and Harbour with some lovely shops, bars, cafe's and places to eat There are many restaurants to eat in on site and the main restaurant for breakfast and dinner is buffet style, take note this can be busy at peak times and rather annoying when busy, however the food is varied and of great quality. This hotel is a real gem and i would hate too many people to find it as it is really special. The rooms are of a very good standard and extremely clean, there is a bath with shower over and a bidet. All rooms have a TV and free wi-fi throughout the complex. It is best to pay for a superior room to get a sea view room with tea and coffee facilities.Ask for a top floor room with a balcony. There are only ground floor and first floor rooms so get a first floor room, we found that the rooms numbered 300 and above were the best n site.The hotel also has its own golf course which has amazing views and is very challenging. The hotel provides a mini bus service to ferry you there. Overall it is a fantastic choice for a holiday. I would give 5 stars if they provided waiter service at all meals. Thank you very much for taking the time to share your experience on TripAdvisor, following your recent stay with us. It gives us great pleasure to note your wonderful comments about the hotel . We hope to welcome you once again in the near future. We visited this hotel on a package holiday with Thomson so that the transfers were all included. The worst service from a tour operator that we have ever had, in terms of misinformation in Tenerife about the ferry and the hostile, aggressive attitude from the Thomson rep on site, Birgitte. Not a great first impression. But Thomson's apart, what a fantastic hotel. Yes, it has many beds, we were told 1,000, but the place never feels busy. The rooms are arranged spaciously through the extensive grounds and are no bigger than 2 storeys high. We had a standard garden view room, which was large in size, and we could see the sea in the distance from our terrace. It was immaculately kept each day by maid service. A little stingy to have to pay for the safe, and for there to be no tea and coffee making facilities. Meals - now this is why my review isn't a 5. The main restaurant lacks ambience, is very busy all of the time and it is better to get a table out on the balcony if it is warm enough. Breakfast was mainly very good - items could be a little cool at times, but the choice was extensive - if you can think of anything that you may like for breakfast, it will be there somewhere. We particularly liked the porridge on our walking days! Evening meal mainly was not good in the main restaurant. We decided after a couple of days to move to the International Restaurant, for a more intimate atmosphere, less canteen style, but still the food could be cool on occasions. The buffet food on an evening really lets this otherwise fantastic hotel down. Rumour has it that the kitchen is to be refurbished this week, will things improve, time will tell. Due to the poor quality of the food, we decided to visit Club Laurel for a set menu on Good Friday for an extra 7 euros per head. Fantastic meal - on a completely different level with very attentive waiter service. On another evening, we visited the Tapas Restaurant - sublime - for an extra 12 euros per person. You wouldn't believe you were at the same establishment. And a couple of nights we ate out in Santiago for a change. Lots of activities on offer if that's what you would like and you could always find a sun bed somewhere by one of the 3 pools. We visited La Gomera to explore the walking opportunities and with the use of the blue Walk Gomera! book and map, did some local walks. All very demanding but in spectacular scenery. We did a guided walk with a local company Gomera Cycling, which was the best day of our holiday, doing a coastal walk in the Hermigua area, with the most wonderful guide Renee. We did 2 trips through the hotel using a local company Timah - one was a tour of the island and the second was a guided walk. The tour was a great day, the guided walk was ok. Too big a group really with a slow walking guide for my fast pace! The hotel also do 2 guided walks, which we didn't find out about until our day of departure, so really look around at what's on offer. All in all a fantastic holiday, no thanks to Thomson, who actually took something away from our experience with their dreadful rep and misinformation about ferry times. I now know why 95% of the time I holiday independently and should I visit La Gomera again, that what I will do. Thank you for having chosen Hotel Jardin Tecina for your holidays and for taking the time to write a review. We are delighted to learn that you enjoyed the Club Laurel and Tapas restaurant. We are sorry to know that your experience with Thomson was not good at all. We truly appreciate your recommendation and look forward to welcoming you back to our hotel. Back from our fourth visit over the last five years to this gem of a beautiful holiday resort, we would like to point out some of the reasons why we, as so many others we meet there and talk to, return to Jardin Tecina year after year. Some guests even come and stay several times each year. Maybe the hotel does not get top scores when it comes to the expanse of areas of polished marble or size of immense chandeliers under high ceilings in the reception, or the height of impressive columns at the main hotel entrance. Maybe the hotel rooms are not stuffed with glitter and foolery to give the guests the “right” feeling of luxury. Maybe the menus at the á la carte restaurant do not give stars in the Michelin Guide or the wine cellar has omissions in the vintages of your preferred chateau wine. To guests who find circumstances like these so painful that they have to tell the world on “Trip advisor” and decide never again Jardin Tecina, I will say “good riddance”. That makes the fabulous atmosphere at the hotel all the more enjoyable for the rest of us who find the whole concept a sheer delight. The hotel rooms are all situated in low buildings of varying sizes, tastefully positioned in the well tended beautiful gardens on the sloping grounds on the rock plateau with astonishing sea views. Almost every room has a separate ground level entrance from the narrow winding walking paths that connect all the “houses” to the main hotel building with reception, restaurants etc. This “village” layout makes for such a peaceful and uncrowded feeling, either as you are in your room, on your terrace or balcony, or while walking around admiring the gardens, on your way to restaurants, swimming pools, tennis courts etc., or out for a walk in the hotel surroundings. The Buffet restaurant can get a bit hectic and noisy at the busiest dinner time. But then one has the choice of avoiding that time or using one of the other hotel restaurants. One can easily understand that this layout of hotel rooms and extensive gardens makes for rather demanding tasks for the hotel staff to keep everything in good order. Yet we have always found our room-cleaning spotless and are amazed at the high level of the constant tending of the gardens. In addition, as a rule, the cleaners and gardeners, as well as the staff at the reception and restaurants, always appear cheerful, helpful and caring, and make you feel that they are your proud hosts and not just there as your “servants”. The nearby Playa Santiago is a small and quiet harbour town and hardly the place for a wild night life. Likewise Jardin Tecina is not a hotel with a high party-factor. The hotel rather offers outdoor relaxation in peaceful and beautiful surroundings, or for the more active guests, excellent possibilities for golf, hiking, tennis, swimming etc. For those that want a taste of “the night life”, the hotel has an entertainment program with a great variation of shows every evening on the stage or dance floor in the downstairs bar. Many of us guests, however, prefer to spend the evenings in the “Bar Kristina” near the hotel reception, listening to the charming and eminent professional pianist Anne Tina at her grand piano. While we were visiting the hotel this time, she was supplied with a beautiful, brand new and larger grand piano. This replaced an instrument with damages which meant that it no longer could give a first class pianist credit. It was obvious to all listening, that the new grand piano gave Anne Tina inspiration to share even greater musical moments with us than before. experience on Trip Advisor following your recent stay with us. We were really delighted to note your comments and that you very much enjoyed the stay with us we will share your feedback with​ all the staff. We certainly look forward to the pleasure of welcoming you back on your fifth visit to Hotel Jardin Tecina . Firstly, let me say that the rooms here are okay - they are very very clean and the furnishings all feel fresh and bright - the style is just a bit like a 1980's version of colonial so it's just neither authentic nor modern. The gardens are absolutely gorgeous and they obviously put in a lot of effort keeping them great. The biggest problem, though are the communal areas and the food. - The communal areas are full of tour operator notice boards and just feel like they need a bit of modernising (they try to be typical La Gomeran architecture, but somehow feel like a pastiche of it). - In relation to the food, I was just generally disappointed. The picnic was made with white bread sandwiches and rather bland ham and cheese as well as a very pink looking salami thing. They had some leaflets advertising an Italian restaurant downstairs on a Wednesday, but when we enquired about it on a Wednesday we were told that it was Canarian and not Italian that day - no explanation given. I have to say in relation to the food that we did eat at the Al la Carte restaurant one evening and the food was fine and the staff were fine. Oh, and if you get a chance to go to the Yoga classes then the Yoga teacher is just lovely - the setting of the squash court is a bit weird, but it's fine. Thank you for your opinion regarding your recent stay in our hotel. We will analyze all the mentioned points in order to improve the services that requires it. We really appreciate your comments and be sure that we will take measures to ensure that the services offered have the quality our clients deserve.